STAAR testing time has come. 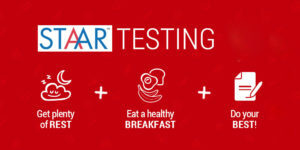 In April 9 and 10, our 4th, 5th, 7th and 8th grade students will take the STAAR tests. We are confident that our students are ready. Students and teachers alike have been working rigorously since the beginning of the school year to master the skills needed to be successful on the STAAR tests. The State of Texas Assessments of Academic Readiness (STAAR™) is a state mandated test that measures the statewide curriculum in reading at Grades 3-8; in writing at Grades 4 and 7; in mathematics at Grades 3-8; in science at Grades 5, 8; and social studies at Grades 8. Furthermore, STAAR End of Course (EOC) tests are administered to students enrolled in Algebra I class. All students enrolled in those courses are REQUIRED to participate in this testing. Attendance is critical on these days. Please ensure your child gets enough sleep the night before. Breakfast will be served as usual so please, get them to school in time to eat breakfast or feel free to provide breakfast on your own. Visitors will not be permitted on STAAR Testing week and if possible, please try to reschedule any doctor’s appointments. State Law prohibits the use of any electronic devices on test days. Please visit with you child and stress the importance of the mandated STAAR assessment and encourage them to their best.